I was an Arsenal fan from about 1996-97-98. Around 2006-2007, my faith began to erode. But now, deep into the 2011-2012 season, I am (as any dysfunctional fan/addict) hoping (again!) for a turnaround … and willing to make amends. I initially became an Arsenal fan mainly because I couldn’t get enough of that genius Dutchman … football artist … incredible forward … da dude … the one and only … Bergkamp. He killed me with his passing, his goals, his genius on the pitch (and his gentlemanliness off it). He was my Rahul Dravid in the football field. I loved Bergkamp. And by association, I began to love Arsenal for giving him the canvas to paint his footballing vision. Then in 2005 they won the FA Cup beating Man U 5-4 on penalties. The year 2005 was the last year they won a major or any trophy. It was the nadir of a long slide downhill. Although we of course had no clue about this decline at that time. Then the “dream team” – The Invincibles – broke up as players like Bergkamp, Henry and Viera retired/left, even as Wenger asked us to keep the faith with a bunch of callow young “talent”. But this new bunch just didn’t win anything of anything of anything at all. But even worse, except for a few, they rest didn’t “get it”. They just didn’t seem to know how to play the beautiful football that Arsenal played. They scrapped, they ran around, they skied the ball, they whined and whinged … and got yellow cards, they slipped and fell, they hoicked the ball from the wings or out of the corner flag straight to the other goalie. And generally behaved as if they were a ragged bunch of school boys (which they were, going by their average age) … and left me in tears of frustration. During this “drought” of beauty hence there was much sadness (sorry Kawabata). My faith in the great Wenger slipped. I had started to become a fan of Arsenal because of a few players I loved who then happened to play for Arsenal. Then I had got hooked on their entire free-flowing playing style and thus their manager. Then I was a full Arsenal fan during King Henry’s pomp. All this meant I was used to seeing them not just win but win beautifully. With style. With panache. Like Rajinikanth tossing a cigarette while threading the ball across a line of defenders. To see a red and white mass streaming forward as they broke out of their own goal area, splitting passes and the opposition defence was a glorious thing to watch. Then suddenly, they didn’t do that anymore. In the last few years, that beautiful part of their game seemed to have gone missing. And that is the most crunching blow for a fan. I really couldn’t care if they lost trophies – cups and that silly shoulder-clutching-men hopping-up and down-in the tinsel-with loud Mahler music be damned. But now it seemed they had even lost their art of playing their mesmerizing, beautiful football. What happened? Why? Is this the end of the world? Has the era of nihilism set in? Are we forever doomed to watch people with money (and terrible shite haircuts) win? Being an Arsenal fan meant in this world you could get away with not being filthy rich but just having art. It not only seemed meaningful in some old-fashioned way, but it was the essence of everything Arsenal, it was why their football mattered. Other teams could go and buy players for stinking bags of euro millions but Wenger’s team would pass you to death and score when they wanted and make you wish you hadn’t. But then, this was not anymore the case. After 2005, they seemed to have lost it. Slowly. Agonisingly. This season (2011-2012), Arsenal started with what seemed a continuation of their last 3-4 years. So I said, ho-hum .. what’s new, I’m SO glad I’m no longer a fan. (And I cried on the inside. Why Arsenal, why have you done this to me?). Yet of course I kept an eye on their results. Moreover, this season they were also missing the extraordinary Cesc who finally (yes, finally after a sad yet wearisome transfer saga) left to Barca. Who was there now? Van Persie … who although extraordinary was also called “glass ankles” for never having finished a season without a serious injury (mainly to the ankle). Wenger went out on the last few hours of the transfer deadline, in what The Guardian called a “last-minute trolley dash”, to buy Arteta, Perstalker or Permstaster or whatever … a German defender, and a few others. I was as befuddled as were surely the majority of the fans. 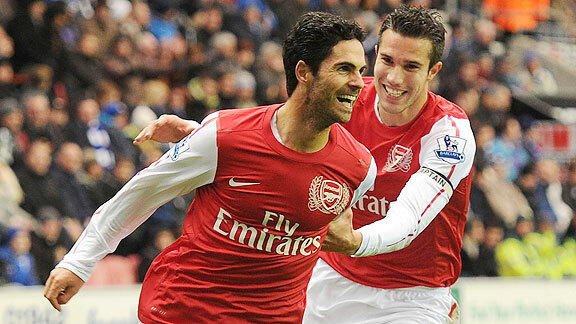 Arteta was a great buy, I’ve always liked him when watching him at Everton. But the others? No one knew what this team was all about anymore. And they continued slipping downhill as the season went on. But by December, some signs of progress were there. Now we are here, in end March. They have left the Champions League but not without a fight while showing some of that old Arsenal panache by coming back within a goal (after a 4-0 deficit in their 1st leg to AC Milan) of making it. Then they demolished the ol’ enemy Spurs 5-2. That game suddenly brought me alive, it was the Old Arsenal. It was all slick, passing moves and blurring movement. There was spirit. There seemed to be … gasp … a team. They were playing together … as they once used to and had forgotten. And more importantly, they were also scoring goals. It was … sigh … again a pleasure to watch them. Now we have eight games to go. And they are in 3rd. Huh? Shouldnt they be in 11th? Or 16th? So … are they still good after all? Was it really just those early season injuries? Is this Arsenal reborn?